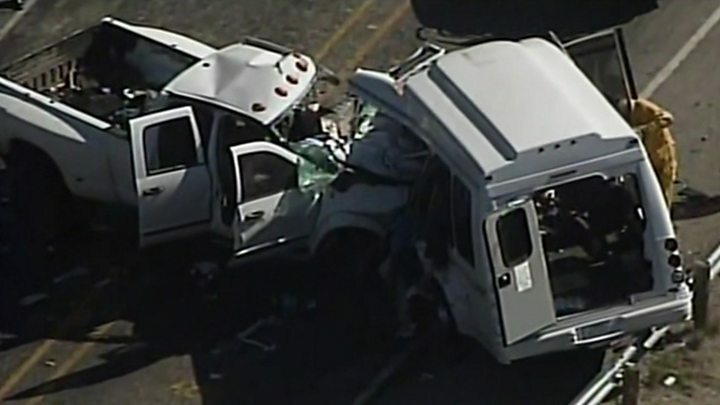 Thirteen people have been killed in a head-on crash between a church minibus and and a pick-up truck in Texas, officials in the US state say. Another two people were injured in the accident near Garner State Park, about 75 miles (120km) west of the city of San Antonio. The bus was carrying 14 elderly members of the First Baptist Church of New Braunfels, Texas. The cause of Wednesday's crash was not immediately known. The accident happened at 12:30 local time (17:30 GMT) as the church members were returning from a camp retreat. Texas Governor Greg Abbot expressed "deepest condolences to the victims and the families of those involved in today's tragic event". Only the driver of the pick-up truck and one of the minibus passengers survived, the latter in a critical condition.